With the help of this patented innovation developed by plusAmpere GmbH the worldwide yields of photovoltaic facilities (PV facilities) can from now on be increased in a sustainable and cost-efficient way. As confirmed by the test results of the two-year pilot phase, the innovative reflector and calculation system known as “pA reflect” offers enormous potential for operators of PV facilities: Under real-life conditions, the yield measured at a reference facility in Southwest Germany showed an average annual increase of 14 %! To provide transparent proof for this additional yield, PV modules only were fitted with reflectors at one of two inverter input points. Specific challenges included the creation of the calculation tool and the evaluation of the generated data. Taking into account project-specific parameters, the calculation software is used to establish values such as reflector surface, angle of inclination and anticipated yield increase. The aim is always to look for the best possible cost-benefit ratio. Doubling the reflector surface does not automatically lead to a doubling of the additional yield! Project-specific data includes, for instance, the geographic location of the PV facility, the azimuth and inclination angle of the modules, the movement of the sun and many other factors. “Compared with current solutions to increase the performance of roof- or ground-mounted installations using rack structures, our innovative reflector and calculation system is very advanced,“ says Klaus Scholl, who as a Rhineland-Palatinate PV pioneer embraced PV from the very beginning. As the founder and managing partner of plusAmpere GmbH he has, over the past three years, developed the innovative product to the point where it has now reached market maturity. Captions: As the pilot phase shows, the patented innovation developed by plusAmpere has enormous potential: The use of the innovative reflector and calculation system improves the worldwide yields of photovoltaic facilities (PV facilities), making them more profitable and cost-efficient. One particularly important question is the following: What is the most effective reflector for the required field of application? Several options are available, i.e. mirrored film, glass mirrors, aluminium composite panels … The reflector solution must be able to withstand the different environmental and climate conditions that exist around the world, which is why plusAmpere uses a mirror for “pA reflect” which has been used successfully in the past. While the use of solar tracking to increase the yield is more effective than a system using rigid solar panels, it is not economically more efficient. A tracking solution produces considerable additional costs for the rack system, the drive and the control and is very maintenance-intensive. 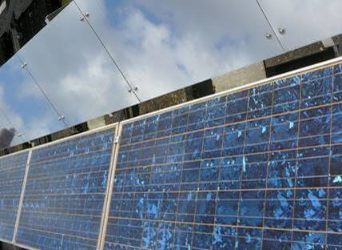 The “pA reflect” sold by plusAmpere offers the ideal alternative solution that helps the operator of PV facilities to achieve the best possible cost-benefit ratio. The rigid reflector system is a cost-effective and simple solution to increase the yield. 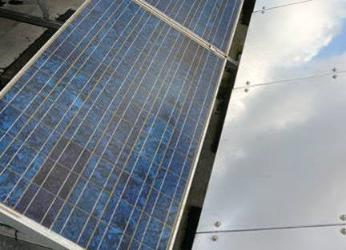 In order to mirror the incoming solar radiation onto the PV modules, the reflectors are installed between the PV modules that are arranged in rows. This retrofitting solution does not require the acquisition of additional surfaces, is profitable and can, in practice, be implemented quickly. Apart from resulting in improved yields, this system more than compensates the operator for any age-related performance losses. For operators of solar parks, plusAmpere ensures optimal profitability of their investment in the long term. If the PV facility is installed at the same time as the reflector system, it requires only one carrier or supporting structure for modules and reflectors. Due to the lower costs involved, the facility becomes profitable more quickly. From now on, operators of existing and planned new PV and solar thermal facilities can very easily benefit from such increased yields. After the successful completion of the pilot phase, plusAmpere has, since the end of last year, been concentrating on marketing its innovation; the intention is to expand its international sales activities and contacts from its base in Kaiserslautern. In the first six months of 2019 two further PV facilities are going to be optimised with the help of “pA reflect”, the innovative reflector and calculation system.